I automatically deleted an email this morning from a salon mini-chain, Shobha, from whose email list I've been too lazy to unsubscribe. But the word "apology" in the subject line of a follow-up email caught my eye. Apparently, others read more carefully and found in the previous subject line, "keep calm & carry on a (Shobha) 6-pack" an inappropriate reference to the riots in London. The subsequent apology is a thing of beauty. 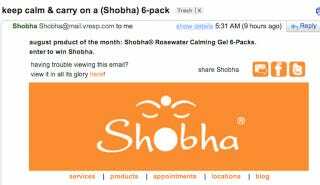 our sincerest apologies if you were offended by our earlier email "keep calm & carry on with a (Shobha) 6-pack." please know, we had the most innocent intentions when we incorporated the phrase, "keep calm & carry on." it was in no way meant to mock the current chaos that is plaguing london & the rest of the uk. we believe the current riots to be a very serious matter & our hearts go out to the families who have been affected by them. in all honesty, before today we hadn't done any historical research on the popular slogan that has been popping up on coffee shop posters. we simply thought it was a really cute phrase & worked well in describing that our rosewater calming gel helps calm the skin & that it is travel-friendly so you can even carry it on a plane. now that we have a better understanding of the term's significance for great britain during wwii, we would like to express our heartfelt apologies as we did not intend to offend anyone. if you should have any feedback or comments you would like to share, please contact us. We are chiefly offended by the cutesy refusal to use capital letters. And then there's the fact that the follow-up email was still a chance to talk about how calming and travel-friendly that six pack is. The blithe historical amnesia is just a bonus.